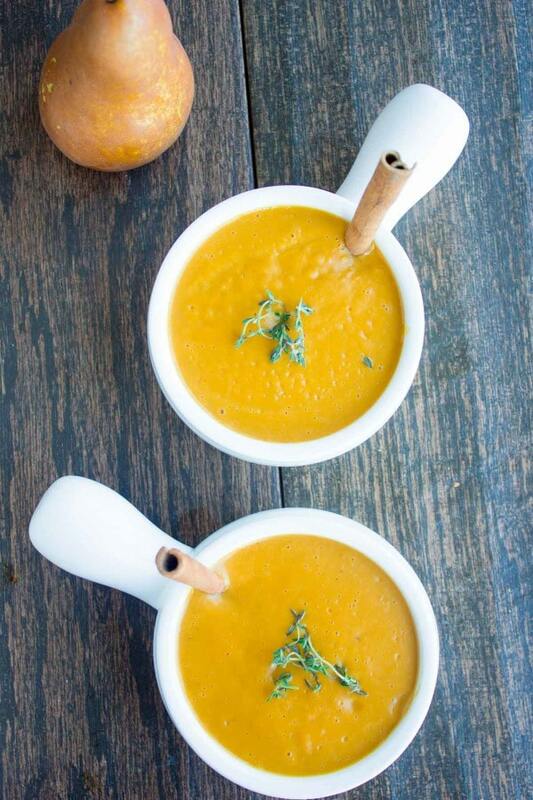 This Mediterranean pear cinnamon squash soup recipe is a beautiful fusion of Spain and Morocco with a load of protein, fibre and veggie goodness. It’s warm, comforting and a perfect rainy day companion. 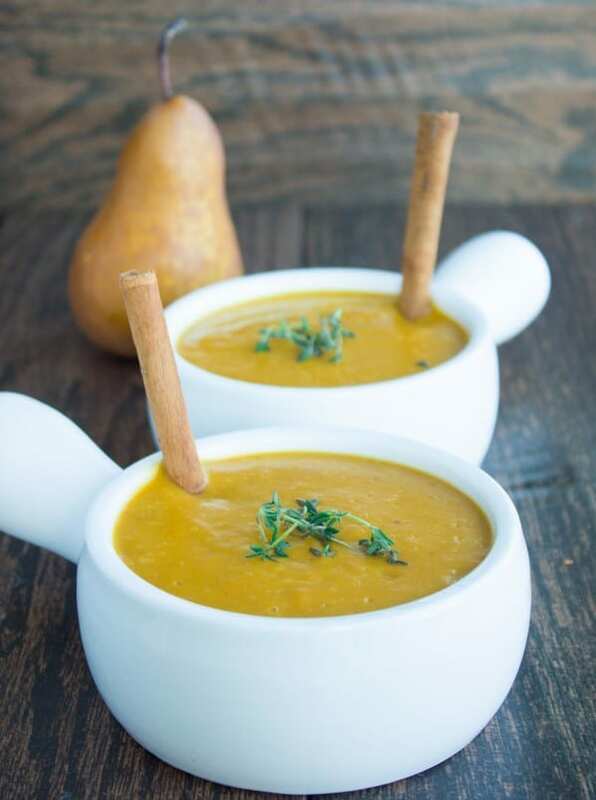 Tender roasted butternut squash, pear and cinnamon are simmered with herbs for a vibrant tasting hearty soup–a must try flavor and mood booster! Soups are always on my list of comfort food, and this particular one is an all time favorite. 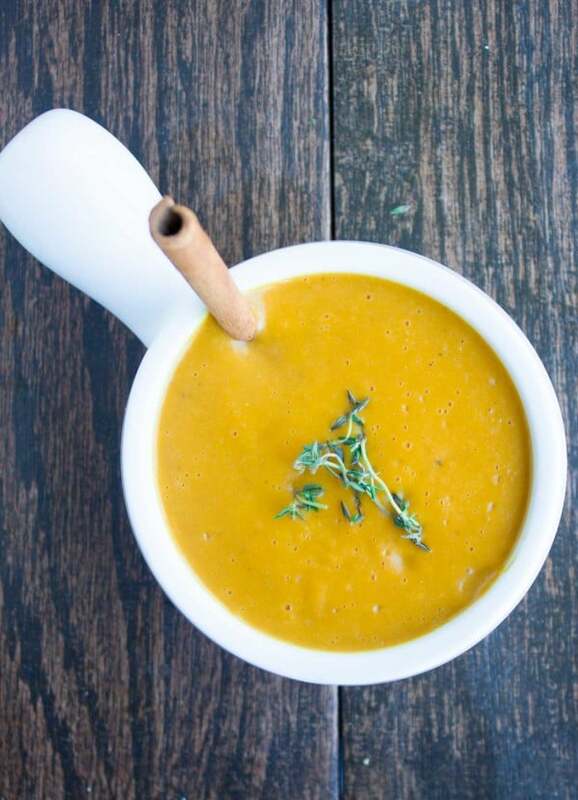 Now just to clarify, I really really really don’t miss a single cold winter soup loving day–I just miss a really comfort loving soup moment and so I made this lovely soup even though it’s warm and summer bright now. 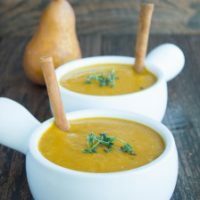 This Mediterranean pear cinnamon squash soup has the beautiful flavors of two beautiful countries on the Mediterranean, and is loaded with veggies and goodness. 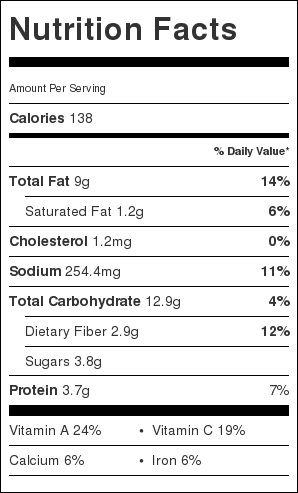 As an added bonus, this soup is gluten free and vegan (without the yogurt), paleo and just perfect for any lifestyle. 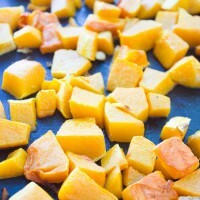 I love roasting my butternut squash in this recipe before I add it to the soup. It takes about 10 minutes and in the meantime you can prepare the other steps in the soup so it’s all ready in time. Roasting brings out so much wonderful flavor in the squash and concentrates the sweetness. It also preserves much of the veggie’s nutrients, which is always a bonus. 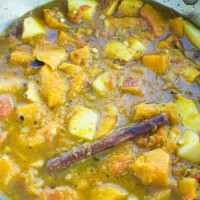 The squash is mixed with the soup and it’s set to simmer so all the flavours come together. If you remember in this cauliflower hazelnut pear soup, I love adding canned white beans towards the end of the soup because they add thickness and offer a nice smooth texture with much added fibre and protein. I do the same thing here. And I add the walnut for a faint flavor and extra creamy feel. You can add any other type of nut if you like, it’ll still give you the smooth creamy feel. Toss the squash with olive oil and salt. Spread onto roasting pan and roast until fork tender, about 25 minutes; set asideto cool. In a medium sized pot over medium-high heat, add the olive oil and sauté the onion until soft. Add 1 teaspoon of dried oregano and garlic; sauté until fragrant, about 1 minute. Add the cooled squash, pear, broth, cinnamon stick, salt and pepper; cover and let it come to a boil. Once boiling, add the beans and walnuts; lower the heat to allow the soup to gently cook over low heat until all of the flavours mix and the pears are fork tender, about 20 minutes. Remove the cinnamon stick and using the immersion blender, smooth out the ingredients. Add the yogurt very gradually, mixing with a whisk to make sure it blends well and turns the soup very creamy. Season the soup; add the fresh oregano and parsley. Can I make day before and warm up. Could it be served cold?